This chapter provides an overview of the main themes of the book. First, the book examines specific methods of combat (e.g., drone strikes, kill-or-capture operations, assassinations) in order to show which factors led to civilians getting killed or injured in such operations. Second, the book explores detention practices used by the belligerent parties (e.g., arbitrary detention, enforced disappearances) in order to provide an analysis of the factors that led to civilians being unlawfully detained. 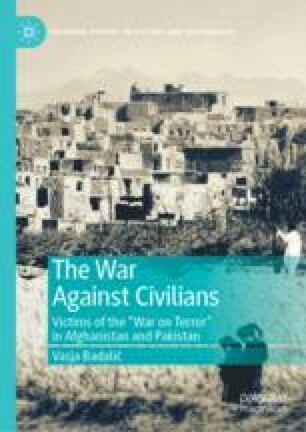 And third, the book examines some other unlawful practices used by the belligerent parties (e.g., torture in detention centers, forced repatriation of refugees) in order to show how they affected the civilian population in both Afghanistan and Pakistan. Actions (in Aid of Civil Power) Regulations 2011 (AACPR). 2011. http://www.isj.org.pk/the-actions-in-aid-of-civil-power-regulation-2011/. Accessed on 7 June 2018. AHRC (Asian Human Rights Commission). 2014. “Pakistan: Balochistan—160 Persons Extra-Judicially Killed, 510 Disappeared and 50 Decomposed Bodies Were Found During 2013.” AHRC, January 7. http://www.humanrights.asia/news/ahrc-news/AHRC-STM-007-2014. Accessed on 18 July 2018. Barker, Memphis. 2018. “U.S. Military Confirms $300m Cut in Aid to Pakistan.” The Guardian, September 2. https://www.theguardian.com/world/2018/sep/02/us-military-confirms-300m-cut-in-aid-to-pakistan. Accessed on 28 October 2018. Clark, Kate. 2011. The Layha: Calling the Taleban to Account. Appendix 1. The Taleban Codes of Conduct in English. Kabul: Afghanistan Analyst Network. http://www.afghanistan-analysts.org/wp-content/uploads/downloads/2012/10/Appendix_1_Code_in_English.pdf. Accessed on 1 October 2017. Crawford, Neta C. 2018. “Human Cost of the Post-9/11 Wars: Lethality and the Need for Transparency.” Costs of War. https://watson.brown.edu/costsofwar/files/cow/imce/papers/2018/Human%20Costs%2C%20Nov%208%202018%20CoW.pdf. Accessed on 9 November 2018. CRS (Congressional Research Service). 2019. “Direct Overt U.S. Aid Appropriations for and Military Reimbursements to Pakistan, FY2002–FY2020.” https://fas.org/sgp/crs/row/pakaid.pdf. Accessed on 24 March 2019. Lauterpacht, Elihu, and Daniel Bethlehem. 2001. “The Scope and Content of the Principle of Non-refoulement: Opinion.” Geneva: UNHCR. http://www.unhcr.org/protect/PROTECTION/3b33574d1.pdf. Accessed on 31 March 2017. “Pence Tells Abbasi That Pakistan Must Do More to Defeat Militants.” 2018. Radio Free Europe/Radio Liberty, March 18. https://www.rferl.org/a/pence-united-states-pakistan-abbasi-taliban-extremists/29106452.html. Accessed on 28 October 2018. SIGAR (Special Inspector General for Afghanistan Reconstruction). 2018. Quarterly Report to the United States Congress. https://www.sigar.mil/pdf/quarterlyreports/2018-07-30qr.pdf. Accessed on 28 October 2018. “Transcript of Obama Speech on Afghanistan.” 2009. CNN, December 2. http://edition.cnn.com/2009/POLITICS/12/01/obama.afghanistan.speech.transcript/index.html. Accessed on 29 October 2018. U.N. Assistance Mission in Afghanistan (UNAMA) and U.N. Office of the High Commissioner for Human Rights (OHCHR). 2011. Treatment of Conflict-Related Detainees in Afghan Custody. Kabul: UNAMA and OHCHR. http://unama.unmissions.org/Portals/UNAMA/Documents/October10_%202011_UNAMA_Detention_Full-Report_ENG.pdf. Accessed on 6 August 2018. U.N. General Assembly. 2007. International Convention for the Protection of All Persons from Enforced Disappearance (ICPPED). https://treaties.un.org/doc/Publication/CTC/Ch_IV_16.pdf. Accessed on 3 July 2018. Wright, George. 2003. “Bush Pledges $3bn Aid to Pakistan.” The Guardian, November 9. https://www.theguardian.com/world/2003/jun/25/usa.pakistan. Accessed on 9 November 2018.